For $6.95CAD, I went with a Free Style Breakfast. 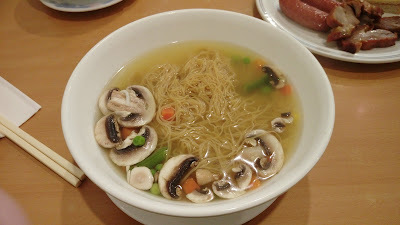 From the menu, I thought it's a simple mix & match soup noodle combo...well, yes and no. 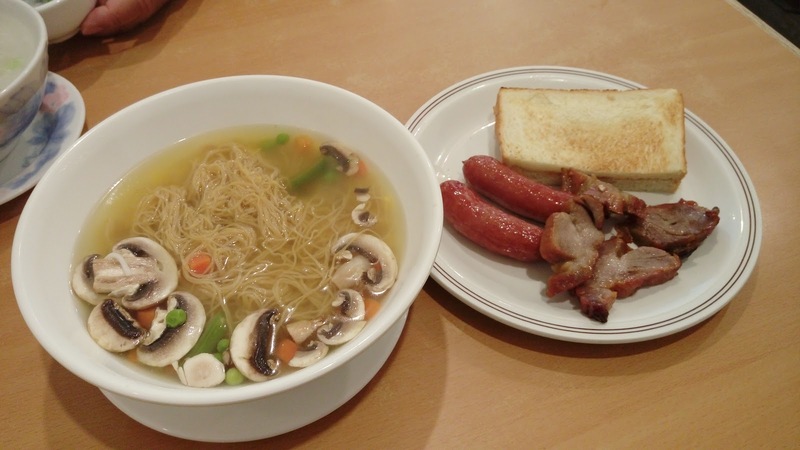 While the soup and noodles were obvious, other chosen elements were served on the side with a slice of buttered toast cut in halves. So, for my breakfast, I opted for BBQ Pork 叉燒 and Black Pig Sausage 黑豚肉腸 with Thin Egg Noodles 自制生麵皇 in soup. The soup was the common wonton broth where the main component was shrimp shells. The only vegetables in the bowl were button mushrooms, carrots, beans and peas. 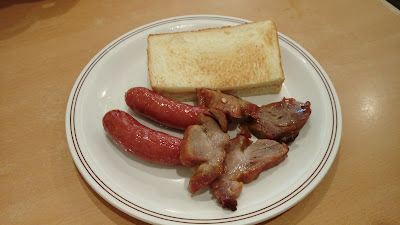 The barbecued pork was tender with a balanced ratio of fat and meat. The sausages were overly sweet and gritty. The noodles were al-dente. Buddha Boy had two different breakfast combos. 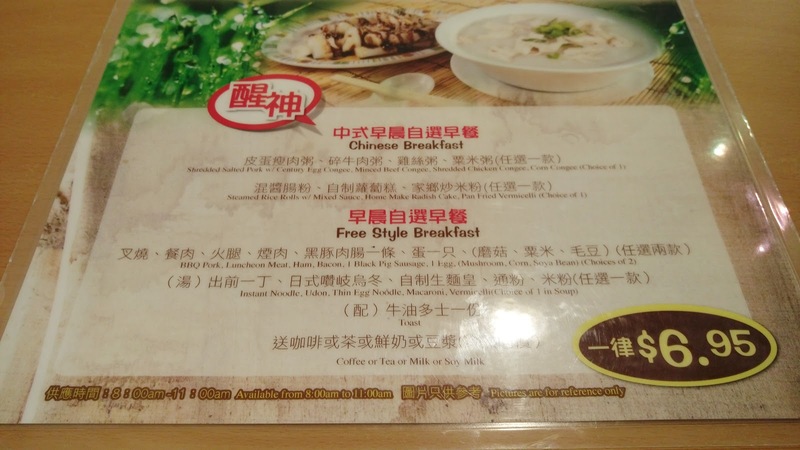 The first was the $6.95CAD Chinese Breakfast with a two-part deal. 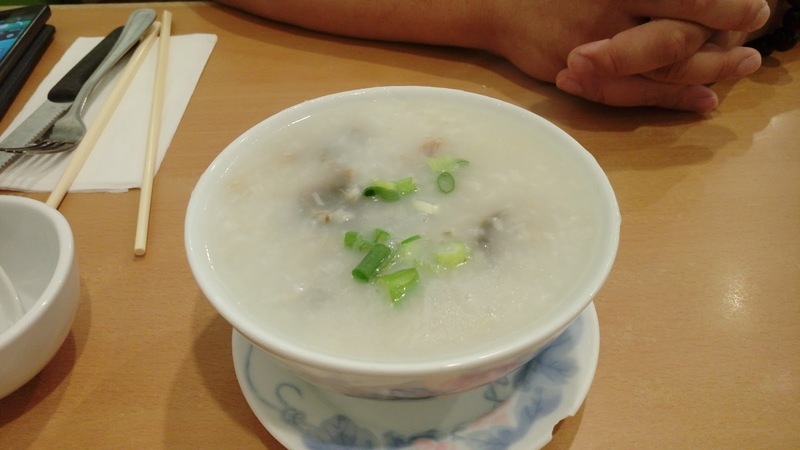 For the first part, he opted for Shredded Salted Pork w/Century Egg Congee 皮蛋瘦肉粥. The rice porridge had good consistency but there's not much meat in the bowl. Good amount of century egg wedges. 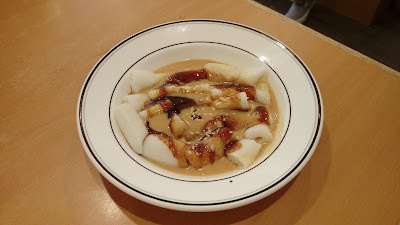 For the second part of his Chinese-style breakfast, he wanted the Steamed Rice Roll w/Mixed Sauce 混醬腸粉. While not the greatest, these plain rice rolls were properly steamed before serving (instead of being microwaved). Buddha Boy's second combo was the $7.95CAD Breakfast Special, which he had the Black Pig Pork Chop and Egg 黑豚肉豬扒煎蛋. This came with a small portion of blanched vegetables and a slice of buttered toast cut in halves. Buddha Boy requested for a sunny side up egg but he got an over-hard egg. 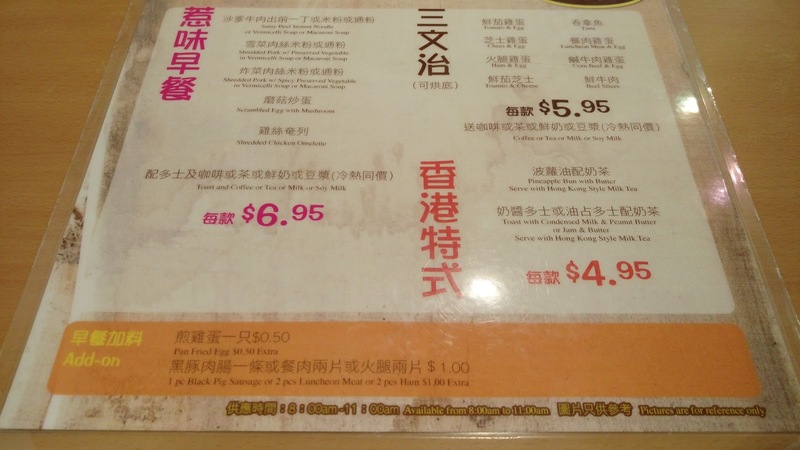 The thin pork chop was tender but not moist. 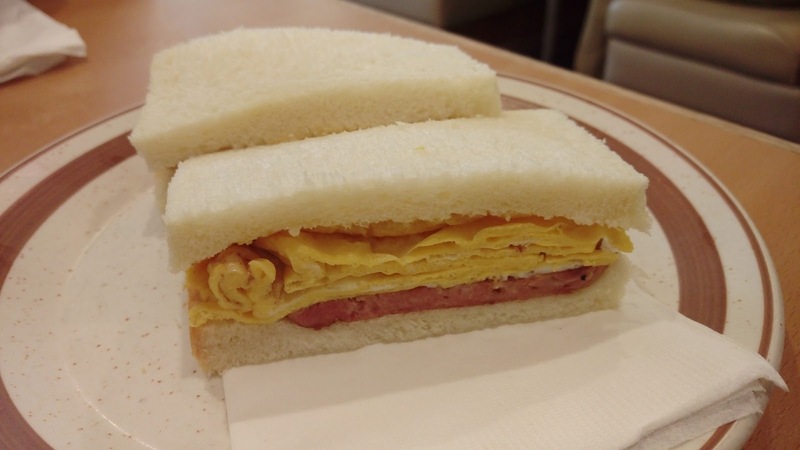 About half way through our meal, I added an order of Luncheon Meat & Egg Sandwich 餐肉雞蛋三文治 to share with Buddha Boy. 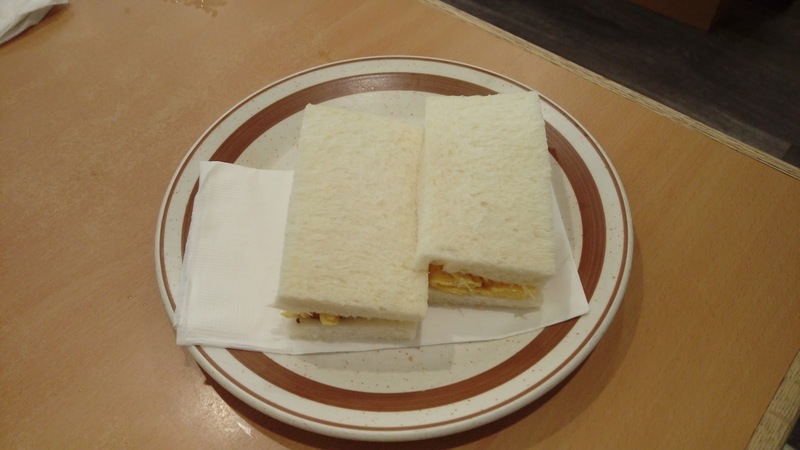 I absolutely love multi-layers of egg in a sandwich. Nothing special, just comfort food. 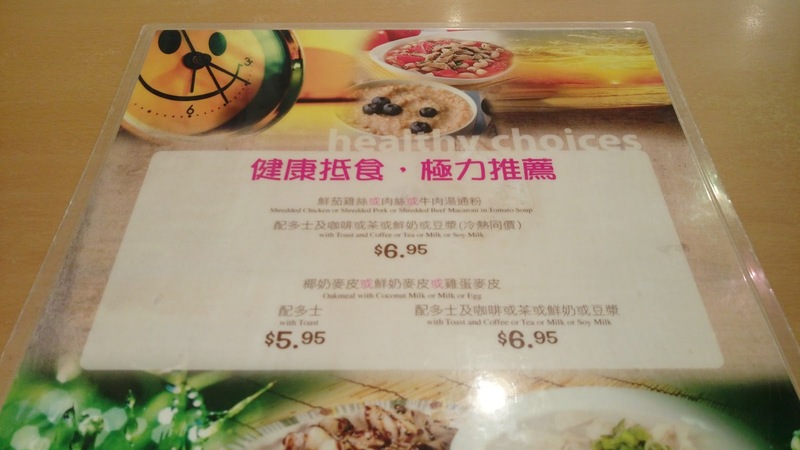 All of our breakfast combos included drinks and we requested four cups of Cold Soy Milk 凍豆漿. 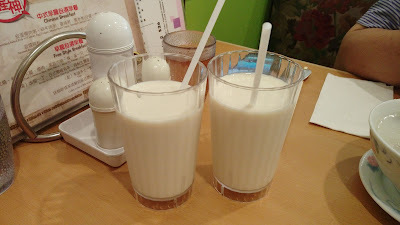 While not rich and bold, the unsweetened soya milk was still pretty solid. Surprisingly, we were pleased with its service this time. 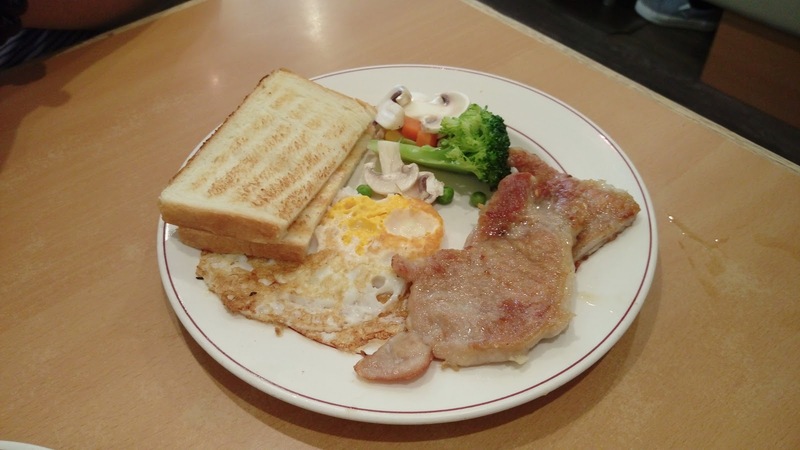 This old school HK-style cafe had that welcoming diner-warmth. 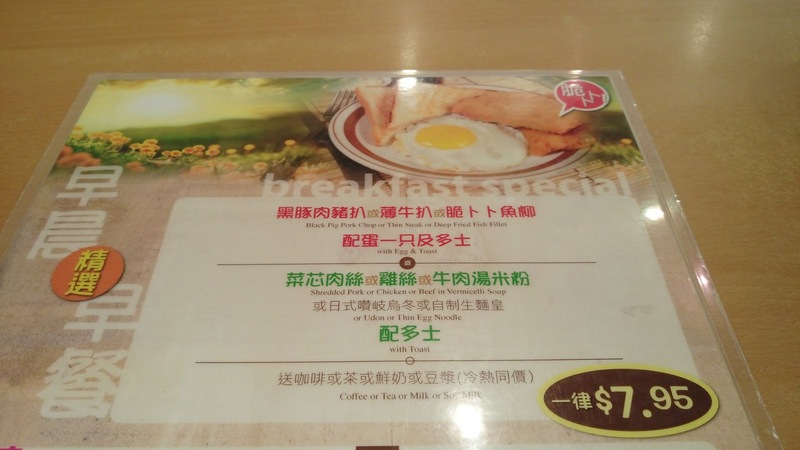 The breakfast prices were extremely reasonable and the portions were considerable. A good way to start the day.